For the Slash's Snakepit album, see It's Five O'Clock Somewhere (album). 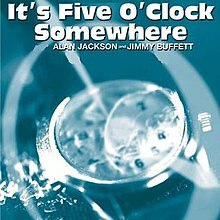 (2002) "It's Five O'Clock Somewhere"
"Far Side for the World"
The title refers to a popular expression used to justify drinking at any time of day, given that somewhere in the world it's 5:00 p.m. (the end of the work day for a traditional "nine-to-five" worker). The narrator states that he hasn't had a day off in over a year and that he wants to leave work and relieve his stress by drinking alcohol. The lyrics include the phrase, "It's only half-past twelve but I don't care. It's five o'clock somewhere", which means that even though it is not five o'clock in the narrator's time zone, it must be in another part of the world. 5 p.m. is typically the start of 'Happy-Hour' at most restaurants and bars. Jim "Moose" Brown wrote "It's Five O'Clock Somewhere" with Don Rollins. (This is not the same Don Rollins who wrote The Race Is On for George Jones in 1963.) Although Brown had several other cuts recorded by other artists, this song was the first to make the final cut of an album. The title lyric was inspired by a teacher who worked with Rollins. Brown recorded the demo and offered it to Kenny Chesney, who turned it down. It was then offered to Alan Jackson, who said that he was looking for a song that he could record as a duet with Jimmy Buffett. Australian Adam Brand and the Outlaws covered the song on the 2016 album Adam Brand and the Outlaws. The video for the song was directed by Trey Fanjoy. It was filmed at the Square Grouper Bar in Jupiter, Florida, which would eight years later serve as the location for the video for "Long Way to Go". It features Jackson performing on a yacht (which he actually owns) called Hullbilly, and later performing at the bar amidst several patrons. When Jimmy's chorus comes into play, Alan walks thru a door and joins Jimmy on stage at a large concert, which was filmed in Indianapolis, Indiana. "It's Five O'Clock Somewhere" debuted at number 31 on the U.S. Billboard Hot Country Songs for the week of June 21, 2003. The song held the number 1 position for 7 consecutive weeks, falling to number 2 on the chart dated September 27, 2003 while Dierks Bentley's "What Was I Thinkin'" overtook it at number 1. On the following chart (October 4), Bentley's song fell, allowing "It's Five O'Clock Somewhere" to return to number 1 for an eighth and final week. The song has sold 1,332,000 copies in the US as of April 2014. ^ Whitburn, Joel (2008). Hot Country Songs 1944 to 2008. Record Research, Inc. p. 201. ISBN 0-89820-177-2. ^ Grein, Paul (April 16, 2014). "Chart Watch: "Happy" tops 4M". Yahoo! Music. Yahoo!. ^ "Alan Jackson Chart History (Hot 100)". Billboard.